After installing the form, I noticed that the form never appeared on another computer. The same computer does not open the jotForm website. Formu yükledikten sonra, başka bir bilgisyarda formun hiç görünmediğini farkettim. 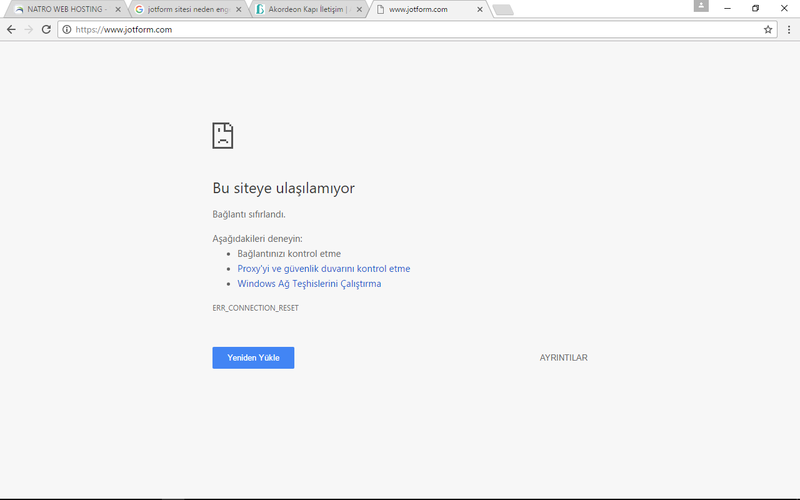 Aynı bilgisyardan jotform web sitesini açmıyor. As I am not able to encounter the same problem as how you explained it, I am suspecting that the problem is caused by your ISP. Can you give them a call and ask if there is a problem on the routing on viewing jotform.com through them? Also, do you have another ISP which can access JotForm? your own ISP den. Problem solved.